When people think of Glasgow they often perceive it as the industrial grey sibling that cannot compare to its big brother Edinburgh. Those people are simply mistaken. I have been to this beautiful town twice yet and while my first visit was throughout a rather rainy time of the year, my second visit showed me the magic Glasgow has to offer. One of my oldest friends has been living here for years now. She is enrolled in the Glasgow University which is one of the main Glasgow sights that will take your breath away. Hello Glasgow University – Hello Hogwarts. 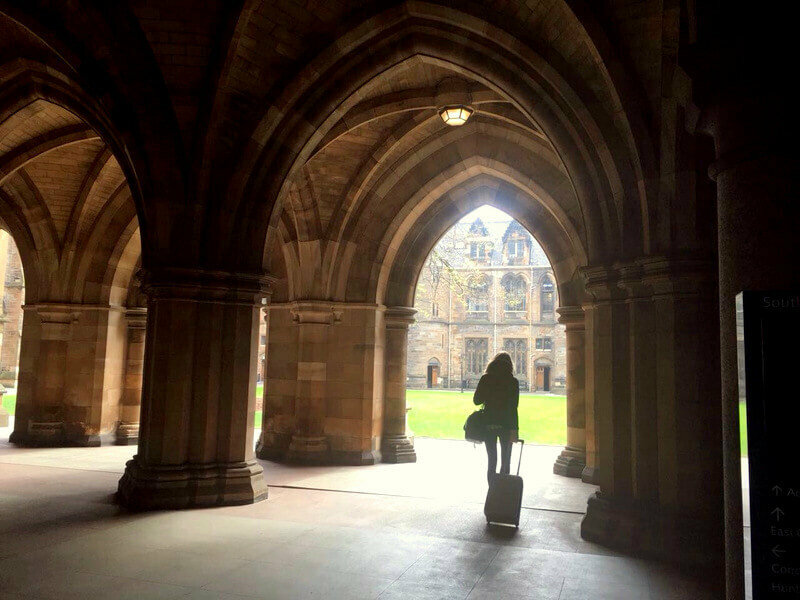 While Scotland is home to a number of sites of Harry Potter, the Glasgow University will give you the opportunity to feel like Harry, Ron and Hermione wandering around campus. Go grab a coffee at the university’s coffee bar and embrace the magic in its surroundings. 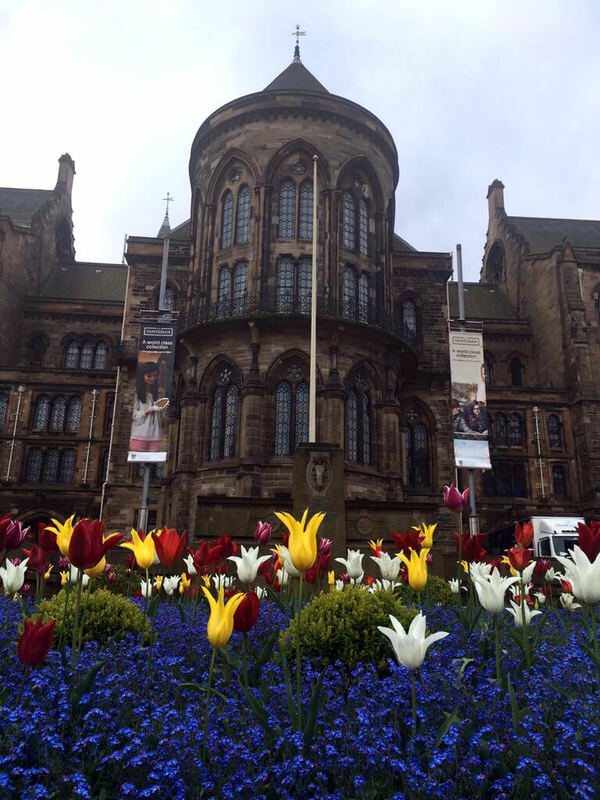 The university was established in 1451 and is one of Scotland’s most famous universities. My friend started as an undergrad in Neuro Science, did her postgrad right after and is currently doing her Phd. She may be one of the smartest people I know and it’s incredible how much she has achieved at this university. Of course, I heard all the student life and graduation stories first hand. So, if you ever want to feel like Harry Potter you should definitely get enrolled here…but of course, a visit will also do. For an in-depth Harry Potter tour, you will need to get further north to the Highlands. Around Glenfinnan you will find the famous Viaduct the Hogwarts Express crosses on the way to Hogwarts and around Glencoe you can find several locations that were used as sites of the film. My friend tells me ‘Kelvingrove Art Gallery Museum‘ is another famous sight you shouldn’t miss. Kelvingrove Park and the ‘Glasgow Botanic Gardens‘ are just around the corner. Not only can you go for a walk along the water stream while American squirrels accompany you but you can also relax at a pretty cool bar/restaurant – the ‘Inn Deep’. Close to the Botanic Gardens is also a really good burger place, called ‘Bread meats Bread‘ …we were so stuffed after our double burgers with caramelized sweet potatoes that we could barely move. Towards the end of the day, you should pay ‘Ashton Lane’ a visit once it’s dark outside…it’s one of these old alleys with a cute touch…especially during Christmas time. Around the corner, you will also find the ‘Hillhead Bookclub’ at ‘Burgh Lane’ which you should check out for the ‘Granny would be proud market‘ which is an indoor vintage and fashion flea market with delicious food and drinks. If you’re looking for a place to sit down and lean back the ‘Tchai-ovna House of Tea‘ will be a good choice. If you’re more into coffee, ‘S’mug’ at ‘167 Great George St’ has pretty delicious and affordable coffee to go. What I love about Glasgow is that you can do an endless number of day trips for a very affordable price. Don’t miss out on visiting the ISLE OF ARRAN. Take a train in the morning and purchase a return ticket from ‘Glasgow Central’ to ‘Brodick’ (20 GBP). The ferry ride with the ferry line ‘Ardrossan Brodick’ is already included in the price. On the island, you will simply need to purchase a day-rider for 4 GBP that will take you around. It would take too much time to walk all the way which is why it’s definitely recommendable to take the bus. Get off at ‘Arran Brewery‘ and follow the signs that say ‘Goatfell’. The trail will make up for a full day hike and an amazing view all over the island. On the way back you can enjoy a beer at the brewery. Another day trip can be a trip to the biggest lake in Scotland – LOCH LOMOND. ‘Loch Lomond & The Trossachs National Park‘ is one of the biggest national parks in Great Britain. Get a return ticket from ‘Partick Station’ to ‘Balloch’ (6GBP). Once you reach Balloch and Loch Lomond, you can spend the full day walking around. It is not nearly possible to walk around the lake in one day though…so don’t even try. To the left, you’ll find the SeaLife Loch Lomond and a local farmer’s market. To the right, you’ll get to the Balloch Castle and Country Park. I think we spent 3-4 hours up the hill sitting on a bench in the sun chatting. The view is priceless. If you’ve got more time you can try to make your way to ‘Ben Lomond Mountain’. Although it doesn’t look far on the map, I heard public transportation to get there is rather complicated but once reached it will give you an amazing view of the lake and its tiny islands. You should also be able to spot the hostel across the lake that looks like a castle from up there. Glasgow and its surroundings can easily be explored on a long weekend…if you’ve got more time even better. And a tip when you book your flight: If the flights to Glasgow are a bit high check out flights to Edinburgh instead. There’s an airport shuttle running to Glasgow all day long and you might end up with a cheaper total price. If you’ve got the time you can even combine it with a visit to Edinburgh which is what I did the first time I was here.